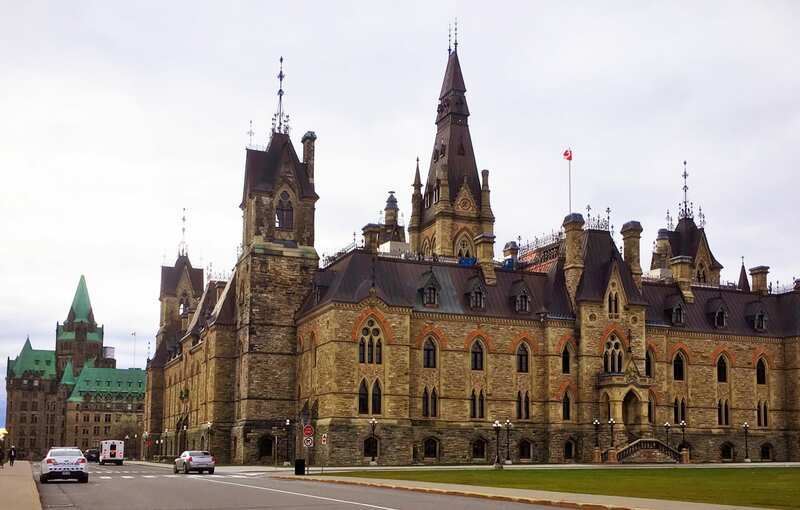 For the past few years, anyone passing the Hill will have noticed the shrouds covering much of the West Block of Parliament Hill, whose exterior brickwork and copper roof have been completely rehabilitated. Now completely uncovered, the building has regained its youthful splendour, the grime and wear and tear of a more than a century repaired in less than a decade. But the true transformation is hidden from public view. 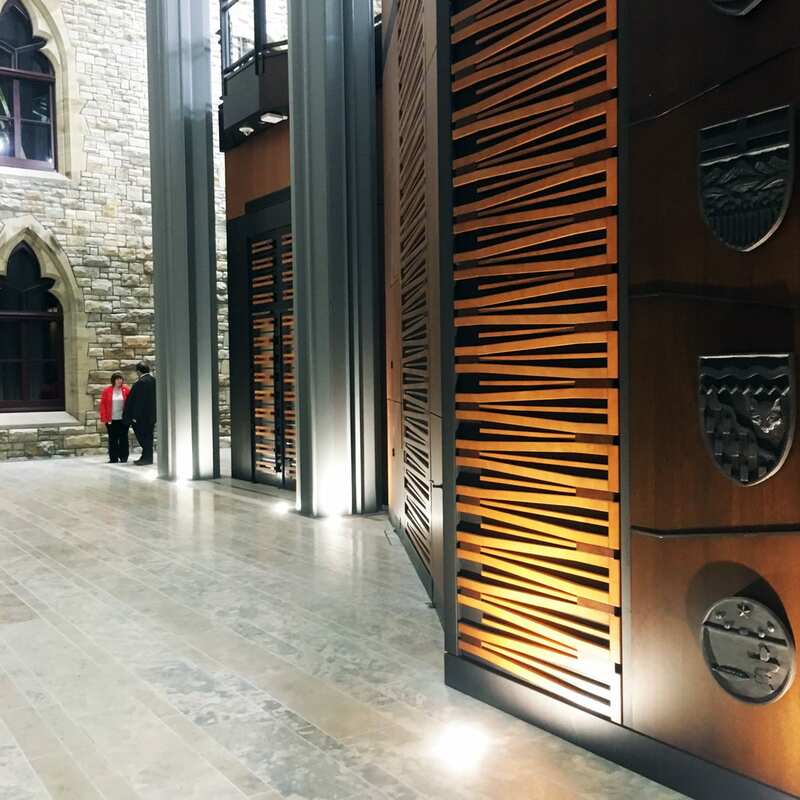 At the same time as the exterior was undergoing its rejuvenation, the West Block’s massive interior courtyard was being transformed into a temporary House of Commons as the Centre Block undergoes its rehabilitation. It will be completed just in the nick of time for MPs to return to the chamber on January 29 after the Christmas Break. Last Thursday, after seven years and nearly $1-billion in renovations, the West Block was officially transferred to the House of Commons. MPs will make this their home for the next decade (or more). 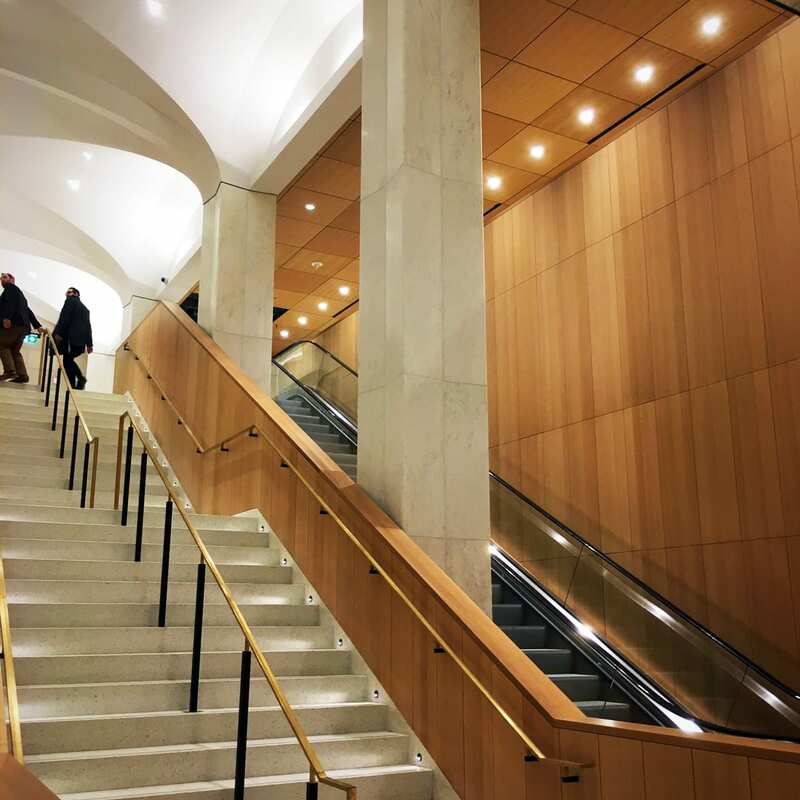 On a media tour of the new chamber and West Block renovation, the architects and public servants behind the design offered up some fascinating insights into the new space. The interim House of Commons encloses what used to be a huge central courtyard. When the West Block was built (1859-65) many larger buildings were designed around a central courtyard to provide light to the offices within. Because the massive new House of Commons structure is hidden from view, it’s even more amazing to enter the building and come face to face with the chamber. This view takes in the raised visitors’ gallery and the temporary Chamber, currently filled with plywood desks holding space till the real desks arrive. 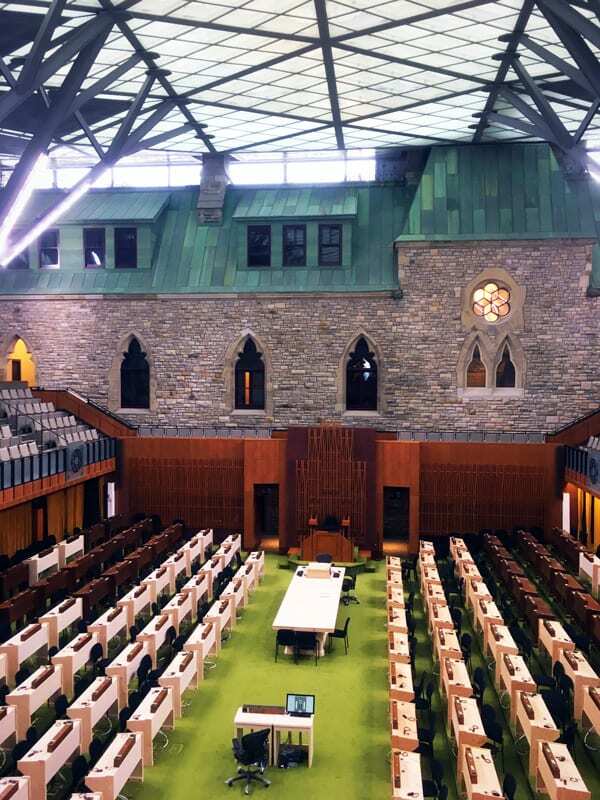 The interim House of Commons is always bright and filled with natural light, with MPs sitting underneath a glass ceiling supported by an earthquake-resistant steel framework. Louvers on the glass can be opened and closed to allow more or less light to flood in. It’s also interesting to note that the Chamber is a separate building from the West Block. The architects did not want the older building to have to support the new structure in any way. The rich wood paneling surrounding the Chamber pays tribute to the look of the original chamber but the modern materials have greatly improved acoustics. 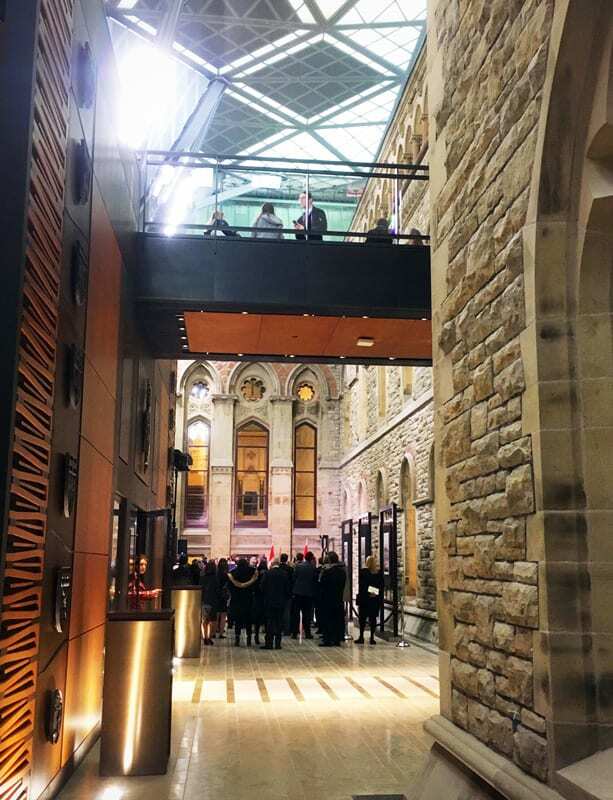 MPs enter the Chamber from the ground floor of the West Block, while the bridge links guests to the visitors’ gallery. A closer look at the exterior of the House of Commons Chamber shows the earthquake-resistant steel framework, as well as the intricate woodwork and provincial shields that surround the main entrance to the chamber. The offices within the original West Block were also renovated. 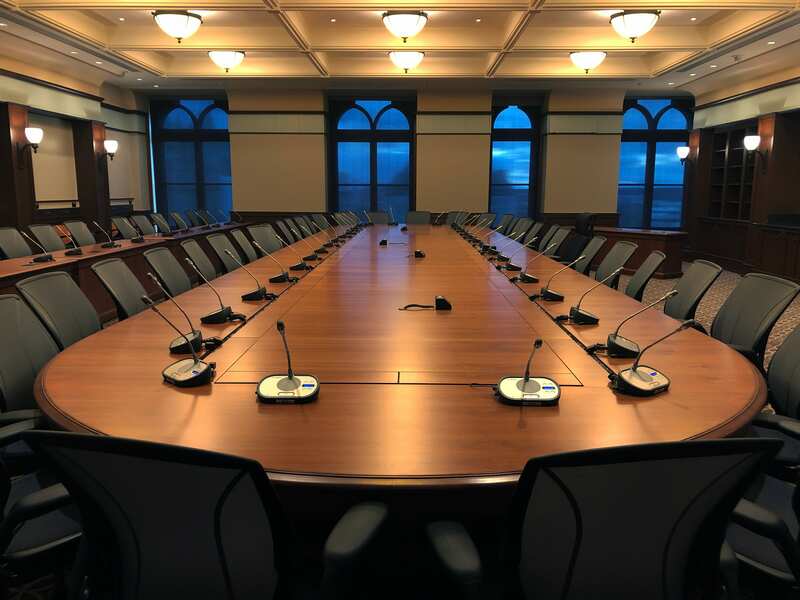 The new cabinet room is spacious, with room to move around and to have extra speakers. A closer look at the walls in a few of the meeting rooms shows millwork designed to improve the rooms’ acoustic properties. A new one-storey building between the West Block and Centre Block now houses a visitor centre on the main floor. Guests are guided through security, then down the stairs or elevator into a large underground chamber. This is the starting point for tours of the West Block, which also houses a boutique — we don’t know, yet, if the goods will radically change, but best sellers in the past have included key chains with the Parliamentary coat of arms, a chalkboard mug of the Hill’s skyline, a pencil case that includes a book-shaped eraser, ruler, and coloured pencils, and the obligatory mini hockey stick.